“This is my commandment, that you love one another as I have loved you.13 Greater love has no one than this, that someone lay down his life for his friends. And above all these put on love, which binds everything together in perfect harmony. Love is patient and kind; love does not envy or boast; it is not arrogant5 or rude. It does not insist on its own way; it is not irritable or resentful;6 it does not rejoice at wrongdoing, but rejoices with the truth. 7 Love bears all things, believes all things, hopes all things, endures all things. Beloved, let us love one another, for love is from God, and whoever loves has been born of God and knows God. 8 Anyone who does not love does not know God, because God is love. Put on then, as God’s chosen ones, holy and beloved, compassionate hearts, kindness, humility, meekness, and patience, 13 bearing with one another and, if one has a complaint against another, forgiving each other;as the Lord has forgiven you, so you also must forgive. 14 And above all these put on love, which binds everything together in perfect harmony. Above all, keep loving one another earnestly, since love covers a multitude of sins. MAY WE HONOR ONE ANOTHER…. And though a man might prevail against one who is alone, two will withstand him—a threefold cord is not quickly broken. Be completely humble and gentle; be patient, bearing with one another in love.3 Make every effort to keep the unity of the Spirit through the bond of peace. MAY WE SEEK GOD ABOVE ALL…. For I know the plans I have for you, declares the Lord, plans for welfare[a]and not for evil, to give you a future and a hope. For because of our faith, he has brought us into this place of highest privilege where we now stand, and we confidently and joyfully look forward to actually becoming all that God has had in mind for us to be. WHAT BIBLE VERSE(S) ARE YOU PRAYING FOR YOUR MARRIAGE? JOIN IN THE DISCUSSION AND SHARE WITH US!! And its shoots will not fail. And put forth sprigs like a plant. We wait in hope for the LORD; he is our help and our shield. In him our hearts rejoice, for we trust in his holy name. May your unfailing love be with us, LORD, even as we put our hope in you. “But now, Lord, what do I look for? And why are you disturbed within me? O Lord God, You are my confidence from my youth. the LORD delights in those who fear him, who put their hope in his unfailing love. But the expectation of the wicked perishes. through whom we have gained access by faith into this grace in which we now stand. And we boast in the hope of the glory of God. Not only so, but we also glory in our sufferings, because we know that suffering produces perseverance; perseverance, character; and character, hope.And hope does not put us to shame, because God’s love has been poured out into our hearts through the Holy Spirit, who has been given to us. For in hope we have been saved, but hope that is seen is not hope; for who hopes for what he already sees? But if we hope for what we do not see, with perseverance we wait eagerly for it. That is why we labor and strive, because we have put our hope in the living God, who is the Savior of all people, and especially of those who believe. God did this so that, by two unchangeable things in which it is impossible for God to lie, we who have fled to take hold of the hope set before us may be greatly encouraged. We have this hope as an anchor for the soul, firm and secure. It enters the inner sanctuary behind the curtain, where our forerunner, Jesus, has entered on our behalf. He has become a high priest forever, in the order of Melchizedek. All who have this hope in him purify themselves, just as he is pure. It was a casual minivan conversation. She climbed up into her seat after preschool. I promised to make her a peanut butter and jelly sandwich with strawberries and pretzels for lunch. She bestowed on me the title of “Best Mom Ever,” clicked her seatbelt, and then asked if she could play on my Kindle. But two days later, I am still thinking about the mercy of this. I may be a good mom, a making-an-effort-mom, an intentional mom, an organized mom, a take-this-seriously mom…. I grow weary. I snap. I grumble over dirty dishes and toilets. I push too hard. I hold on to things when I need to let go. I feel distracted or selfish. I forget. This girl, though, this tiny encourager in the minivan seat behind me, doesn’t give me what I deserve or merit or earn. She overlooks the faults and failures. And this is how I’ve learned to pray. “God, have mercy on me, a sinner” (Luke 8:13 NIV). And that blind man begging by the side of the road heard that Jesus was passing by and what could he cry out? That he deserved healing? That somehow he had suffered long enough and had earned a miracle? “Jesus, Son of David, have mercy on me! (Luke 18:38 NIV). This mercy prayer is what Jesus loved, the one that caught His attention and made Him pause, turn aside, and deliver. Lord, have mercy. Even Daniel, this man so righteous in the Baylonian world of unrighteousness, knew he couldn’t pray because of his own merit. We do not make requests of you because we are righteous, but because of your great mercy (Daniel 9:18 NIV). So I pray this also about situations for others and situations for me: Lord, have mercy on me! This is no manipulative mantra, no magic incantation. It’s not the words themselves that matter. It’s the attitude of my heart. God delights in the humble. He shows compassion to the needy. And it’s right here where I recognize my utter dependence on Him that He shows His glory most clearly. God, I know what I’ve already been given—mercy and grace, so much grace. You have been good to me. And I know I can’t come here asking for Your help because I’ve worked this hard or because I am this good. Not because I’ve tried to obey or because I’m righteous. Not because I’ve spent this much time in Your Word today or got down on my knees when I prayed instead of praying with my eyes open while I’m driving. There’s no holy act that could earn me the right to ask this…. No amount of “good” that makes me “good enough” to request Your favor or Your blessing. And yet, I pray simply because You are merciful. Scripture says God hears my prayers, but the answers don’t seem to come and it feels like He’s not even hearing me. Am I being too bold? Am I asking for too much? Are there far more important things on His agenda? Am I complaining too much and should I just settle for less and be grateful for what I get? Am I too needy? Too demanding or spoiled? 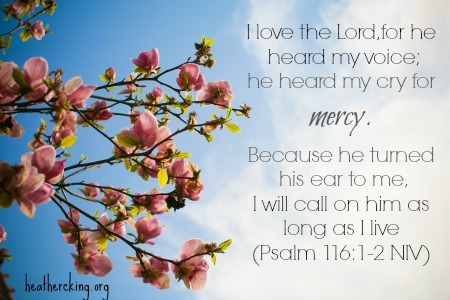 I will call on him as long as I live (Psalm 116:1-2 NIV). He blows this fresh wind of mercy over me and He fills my hyperventilating lungs with His very own breath of hope and life. I still can’t see the answer to my prayer. I don’t see the solution or the end. But I know this—He hears my cry for mercy. Ask Me More…Where were you? She said her dad didn’t love anybody. Not her mom. Not the kids. Nobody. That’s what the girl told my daughter. And that’s what my daughter told me. My daughter struggles to understand this invasion of innocence. We adults slowly learn to cope with the ugly truth about how sin distorts, taints, and breaks. How this world is hard sometimes, hurtful and messy. What does that mean? How come her family isn’t together any more? Why does that happen to families? Where will she stay? Will she still see her dad? Pain often provokes our questions, too. There’s something about tragedy that stirs up doubt and wondering. We want to wrestle with the beasts of injustice and sorrow, trying to make sense of it all with logic and defeat them with some philosophical musings. But we just don’t know. We can’t always see why this happened or how it will all work out or what good could come of any of it or what God is doing in the midst of the rubble. In Scripture, it’s Job that engages in this fight. We gloss over his pain so quickly as Christians: Job was a good guy who had bad things happen to him. Lots of bad things. Blah blah blah, yeah yeah yeah. Yet, every single one of his children was killed at once in a freak accident. If you’ve cradled your own baby in your arms, stroking his cheek with your finger, cooing baby talk, tickling her baby belly, rocking and swaying and humming sweetly, then consider Job’s loss. Seven sons, three daughters—-dead like a snapping of the fingers. How could he ever breathe again? No wonder he just wanted to die himself. So, he ponders and postulates and asks God to explain Himself. He longs to put God on trial and pose the questions with God on the witness stand. “Where were you?” Maybe that’s what Job longed to ask God and have answered. Yet, God never answers all of Job’s questions, not in this life anyway. Instead, God lets Job pour out all of that bitterness and hurt, knowing perhaps that what we need most in sorrow is the opportunity to be sorrowful. Then, God responds, not with answers, but with questions. Lots of lots of questions. Chapters and chapters of questions. Pages and pages of questions. Just about 60 in all. “Where were you when I laid the foundation of the earth? Was Job there when God parted the seas from the land or set the birds in the sky or there as He makes the sun to rise and set every single day as faithfully as our faithful God? Does Job even know how God makes it rain, or feeds the lions, or transforms water into ice? The questions bring Job to this place where he looks in a mirror and sees his own limitations. What else could he say? “Behold, I am insignificant; what can I reply to You? Sometimes there’s not much else to say. And that no purpose of Yours can be thwarted. Our God lives and will return one day in victory to redeem us and to redeem this broken world. God can do anything There’s nothing too insignificant to escape His notice and nothing too difficult for Him to handle. When God asks us questions, we might not always know the answers, but we know He does. That’s the simplicity and the challenge of faith. I could recognize the discouragement. The perpetual fatigue in the face and in the slumping of the shoulders, not extreme, but ever so slightly burdened down low. It was clear in the mechanical activity, not the joyous friendliness of cheerful service like before. Now my friend moved from point A to point B, task one to task two, not smiling, just doing because doing is what needed to be done. We who have been weary can see the signs in others, the trudging, the exhaustion, the worn out soul fraying at every edge and held together with patches and slipshod stitchery. So we come alongside our friends, our Christian sisters and brothers, those whose burdens we’re supposed to remove so they can walk free and unencumbered for a time. We remind them of God’s goodness, His grace. We encourage them in their efforts, cheering them on with reminders to persevere and not give up and yes, there will be a harvest in time, and no, it isn’t all in vain. How do we know? That’s what they might ask. Oh my friend, how I know. Because contrary to what you might have heard or expected, the Christian life isn’t all easy and Christian service isn’t all joyfully inspiring and pouring out to others out of an overflow. Sometimes we’re emptying out the last few drops from our own parched souls, not knowing what to do when we’re dehydrated and depleted and still others hold out needy hands for more. Yet, we know this also. We pour out…everything….and He pours in anew. You might think you’re alone in this, stumbling over your own weaknesses, serving to exhaustion, not seeing the reward or the gain or the purpose or the point. Yet, the prayers of saints long before teach us that others have desperately needed to be renewed, revived, restored. so that Your people may rejoice in You? as streams renew the desert. will harvest with shouts of joy. and give me a willing spirit (Psalm 51:10-12 HCSB). Their prayers would be unnecessary, meaningless even unless they felt the need for the renewing, the reviving, the restoring work of God in us. We need the grace again, the joy again, the steadfast spirit again, the life again. That’s what they asked. That’s what we need, too. Nothing suffers from time quite so much as religion. The skeletal structure of obedience becomes arthritic, and the circulatory system of praise becomes sluggish. The prayer ‘revive us again’ keeps the body of Christ youthful and responsive to every new mercy and grace in God (Praying With the Psalms). So we offer to help carry the cross for a time through this valley and we remind them of the hope and the promise as we travel along together. We tell the fullness of our testimony, not just the revival, the renewal, the restoration after the fact…not the destination without the journey or the end result without the in between. No, we remember that we were worn out and limping and God renewed us. We were dead and hopeless and God revived us. We had lost everything and God restored us. God did this for me, that’s what we say. And He will do this work in you, too. And we pray, of course we pray. We ask God to fill them right up again, fill their own parched souls so they are overflowing. We ask for strength anew and energy for each day, for reminders of the vision and reassurance of the harvest. God’s plan isn’t for us to walk through discouragement alone, not any of us. How could we ever survive it, after all, if we thought we were the only ones and that somehow we must be here because of our own fumbling and faltering? But to know others have been there, have made it through, and have traveled back to tell us the good news and to pray for us along the way…that’s the grace God gives for a wearied soul. 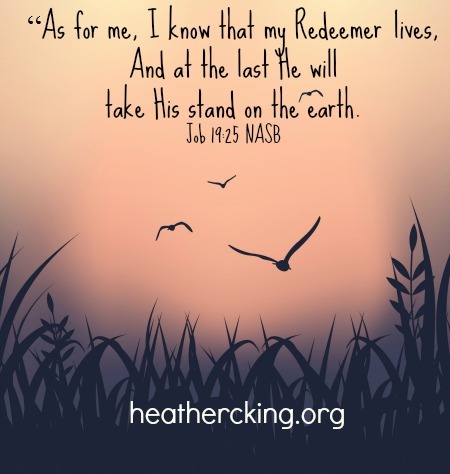 Heather King is a wife, mom, Bible Study teacher, writer and worship leader. Most importantly, she is a Christ follower with a desire to help others apply the Bible to everyday life with all its mess, noise, and busyness. Her upcoming book, Ask Me Anything, Lord: Opening Our Hearts to God’s Questions, will be released in the Fall of 2013! To read more devotionals by Heather King, click here. I bought it on a whim and I’m so glad I did. Years ago, I was filling my garden with herbs. I bought the tiniest pots of rosemary, lavender, sage, thyme, oregano, basil, parsley and chives for $2 each and just hoped they’d grow larger over time. Then, as I left the garden center one day I walked by another table of herbs. I thought there’d be nothing among those leaves to entice me—now the proud owner of herbs I knew how to cook with and some I didn’t. I almost passed by without even looking, but as I did a breeze blew thro ugh and I caught the hint of the most heavenly scent ever. It was a tiny pot of peppermint. Over the years, some of those miniature $2 herb plants have overtaken my garden. The rosemary has invaded the entire back left corner. I keep cutting it back and still it grows undeterred. The basil last year towered over my six-year-old daughter and made me crave Italian food every time I climbed the steps to my back door. Then there’s the peppermint. It quickly spread and overtook every available space in the right corner of my garden plot. Now, as I sit here typing away next to an open window, I can smell the scent of fresh peppermint even with the gentlest breeze. I’m pretty sure heaven smells like peppermint. And if the aroma of heaven is sweeter than that, it’s aromatherapy at its greatest. There’s no “if” about it, though. We know for sure that God has His own brand of Scentsy and His own favorite aroma. And believe it or not, it’s sweeter than fresh peppermint dancing in a spring breeze. “Another angel came and stood at the altar with a golden censer, and he was given much incense to offer with the prayers of all the saints on the golden altar before the throne, and the smoke of the incense, with the prayers of the saints, rose before God from the hand of the angel” (Revelation 8:3-4). Our prayers are being mixed with incense and wafted before God’s throne all the time. It’s the cries of our heart and the pleas for grace, the humble praising of His name, and the intercession on behalf of others that fills the throne room. They are a continual offering to God, a sweet-smelling sacrifice that brings God joy. This, then, is truly my heart’s desire. I want to smell nice for God. Sound foolish? Perhaps it seems silly at first. And yet, what I really mean to say is that I want to be pleasing to Him. I don’t want to be the foul odor among the incense of the saints’ prayers. I don’t want to be the one lone stench among the sacrifices offered up to my God. I want Him to receive my prayers with pleasure and to take joy in the life I offer to Him, in the planned prayer times spoken at my table, in the heartfelt cries I send up to heaven without premeditation, and in the thousands of conversations and the running dialogue I carry on with Him every day, all day. This isn’t a mystery, either. We aren’t left to guess what life-scents God enjoys and which of those He finds distasteful and nauseating. In Exodus and Leviticus we read that the sacrifices burnt on the altar before God could be a “pleasing aroma” to Him (Exodus 29:18, Exodus 29:25, Exodus 29:41, Leviticus 1:9, Leviticus 1:13 . . . ). When offered with obedience, these burnt offerings brought God pleasure. Yet, God told the Israelites “if in spite of this you will not listen to me, but walk contrary to me . . . I will lay your cities waste and will make your sanctuaries desolate, and I will not smell your pleasing aromas” (Leviticus 26:27, 31). Lives of disobedience and idolatry became the stench of garbage and death before God. He held His nose at their offerings and didn’t receive their sacrifices. So when you choose to obey Him, even when it doesn’t make sense and doesn’t fit into your five-year-plan, you are spraying on the perfume of the God-life. When you pray with humility, when you commune with Him continually, and when you offer up praise, your prayers drift through heaven like peppermint on a breeze and like the candles making my living room smell like honeysuckle on a summer’s eve and my bedroom like gardenias in bloom (my favorites!). This has become my prayer for today and the days ahead, that the life I lay on the altar before God, the offering up of my actions, my words, my thoughts, and the hidden motives of my heart, will be acceptable to Him. And that the prayers I place at the feet of His throne are a pleasing aroma of incense to my God. 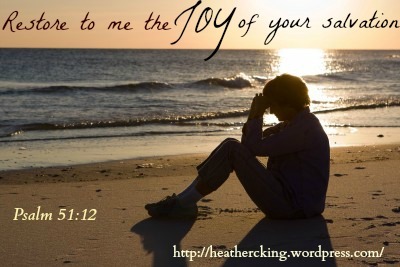 Heather King is a wife, mom, Bible Study teacher, writer for www.myfrienddebbie.com and worship leader. Most importantly, she is a Christ follower with a desire to help others apply the Bible to everyday life with all its mess, noise, and busyness. To read more devotionals by Heather King, click here.